April 27, 2018, 11:19 AM · Last week I was asked to sub at the last minute for an orchestra concert, and happily my schedule allowed me to say "yes." So what would be on this concert? Among other things: "Don Juan" by Richard Strauss. Wait, what? Do people actually play this piece for anything other than auditions? Yes, this is perhaps the most infamous audition piece for violin; something one must learn when trying out for just about any orchestra. It's full of tricky, fast playing that goes all over the fingerboard. It has to sound crisp, clear, accurate and brilliant, and then there are some lyrical bits sandwiched right into all the madness. To be fair, I've played the piece a number of times in a concert (and playing the second violin part makes matters a lot easier as well.) But I've practiced and played it far, far more times for auditions over the years. For a long time, there, I knew the first page of the first violin part inside and out, without ever having played it with an orchestra, in a concert. The excerpt(s) required so much practice, so much obsessive nit-picking, entire coaching sessions just on the excerpt -- I came to view it as a nemesis: a little piece of cruelty blocking the entrance door to any orchestra. It's easy to forget that this piece is actually one heck of a fun ride, if you can change your mindset. It's Romanticism in its most exuberant, over-the-top form, a roller coaster that just keeps going up and up, around and around, the balloon inflating and inflating until it pops, and it doesn't take too long for our hero's summary demise. Very amusing melodrama, with a lot of juicy string playing. April 27, 2018 at 06:53 PM · Yes! Scariest concert of my life! April 27, 2018 at 08:28 PM · I played it in college in a medium-quality community orchestra (I was principal viola). As if that wasn't scary enough, the conductor asked his friend, who just happened to be principal of the CSO, to sit in the back to pad the section. It was embarrassingly awful to say the least. April 27, 2018 at 08:33 PM · Strictly speaking, none of the above. Have played it but never in concert. Did prep the piece, though, over the course of a week when I was a member of the CSO's training school, barely out of my teens. I don't recall all details, but I remember that all sections prepped it first in separate section rehearsals. Then, 6 days later -- and I do remember that it was a Friday evening -- the full orchestra gave the piece a run-through. One of the CSO's co-concertmasters sat in on the session and liked the results. I have the very same sheet music in my collection that's in the photo above. When well practiced, it's fun to pull off. Never did it for auditions. I'm tempted to dust it off now and entertain the neighbors with it during evening fiddling sessions in the garage. I love the sound of the score -- which strongly resembles the composer's Till Eulenspiegel, which followed a few years later -- and in which another hero (?) meets his demise. April 27, 2018 at 08:38 PM · After all the time learning the 1st vln part for auditions, I joined the 2nd violin section of a good orchestra. I just about break my arm skipping DOWN the octave near the beginning when every fibre of my being is telling me to shift up! April 28, 2018 at 01:35 AM · No Don Juan for me. But I joined a orchestra when I was 13 years old. We got our parts at the first rehearsal. My teacher was the CM, that's how I got a seat at the back of the first violins. And the first thing the conductor said after bringing the rehearsal to order was, "Let's start with the Glinka." That's right ... very first orchestra rehearsal of my life and I'm expected to sight-read the Ruslan and Ludmilla Overture. We didn't play it as fast as the Evergreen Symphony (see YouTube) but still: I'm scarred for life. 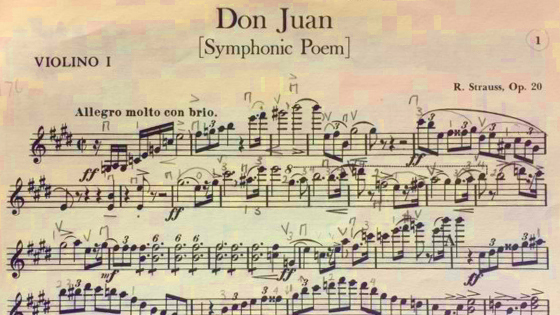 April 28, 2018 at 04:42 AM · Don Juan will be out and about on the 27th of May thanks to the University of Melbourne Symphony Orchestra (https://tinyurl.com/y7q6kmvj). April 28, 2018 at 06:44 AM · Very first orchestra rehearsal of my life, I was sight-reading Brahms 1 -- when I was completely self-taught and had played for a year and a half. No Don Juan yet, but I performed Don Quixote last month on all of four rehearsals, and it was also a wild ride. April 28, 2018 at 07:04 AM · Leading the seconds in rehearsal my first entry would consistently beat not just the rest of my section but the whole orchestra by a semiquaver. Since our conductor always made a thing about us playing "on the stick" (and a semiquaver is a very short time in this piece) I still reckon I was the only one in step. In the performance I reluctantly backed off a fraction. April 28, 2018 at 06:36 PM · I voted "Played it in concert, 2nd violin" because that is the part I have played the most often, but I have also performed it on 1st violin more than once. April 28, 2018 at 06:42 PM · Hi All im rookie here. Good article! Thx! Love your stories! April 28, 2018 at 07:46 PM · I have performed it 3x on vla (in 2 countries) and 1x on 2nd vln. Oddly, never for an audition. Tough, but great fun. April 28, 2018 at 08:19 PM · During studies I played it once in the 1st violins, later several times as the first leader in the violas. Both great fun!!! Of course in the auditions as well. April 28, 2018 at 09:58 PM · Re: "I came to view it as a nemesis: a little piece of cruelty blocking the entrance door to any orchestra." I can relate! There is something (actually, many things) parallel to it asked at interviews for Data Scientist roles at some large companies in the San Francisco Bay area. April 29, 2018 at 12:18 AM · When Michael Ludwig became CM of the Buffalo Philharmonic he gave a clinic at SUNY Fredonia. Students play'd their concerti etc and he commented, praised, made suggestions and was Wonderful. One gal said she was preparing for an orchestral audition and wanted comments on the usual audition requests. She did a great job with Don Juan....Ludwig praised her but said, 'What if the committee wishes it at this tempo ?" He proceeded to play it at a tempo that left all of us breathless.... He offered a wry smile and suggested that at times audition's real order was altered by such tactics..and to Be Ready. April 29, 2018 at 10:27 PM · Hello Laurie -- I play my violin/s for personal pleasure and gratification. The Don Juan piece achieves neither of those two goals for me. If I were to hear Don Juan being played at a concert, I am confident there would be an entirely different reaction, all positive. In reality, I would much prefer to pay the price of two concert admissions rather than put myself in a course of action that would allow me to be capable of playing Don Juan. My journey with my violins is not nearly completed, so I'll just keep my eyes on the prize and skip Don Juan for the time being. April 30, 2018 at 02:19 AM · Now supposedly retired, I was a professional symphony player, mostly in 1st violins, in 2 countries. "Don Juan" was a favorite, since the orchestras were large and had brass sections to support it. I also prepared Don Juan for auditions that I would do "someday". What an exhilarating work, truly! But you always have to take a look at before the first reharsal...just to make sure. I had it memorized for a long time. It's been a while since I've performed it, but I figure I can still pull it off. It's fun to look at the first page and see what looks like an almost exact copy of my part at home...fingerings, bowings, everything! To the newbies out there....Learn your parts forever, not just the next concert. You WILL play it again! Remember ~ Don Juan is a Classic!! May 3, 2018 at 04:38 PM · I've never played Don Juan, but I think that Strauss' Till Eulenspiegel, which I played last year for the first time, is a similar experience: obsessive, nit-picky, and very challenging, but exhilarating to do well when you finally get there.